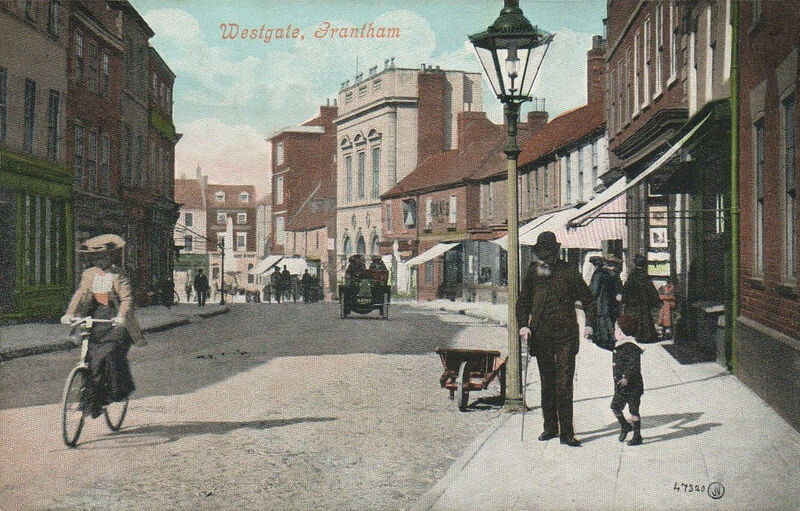 Westgate, Grantham, 1906. Arthur Ball was apprenticed at a Chemist's Shop on this street 1915-1917, before joining the RAF. Arthur William Ball was listed on the Absent Voters records 1919 as a Lieutenant in the R.A. Force High Street Bottesford. We have only limited information about Arthur Ball. He came from the south east of England, and was the fifth child of Clara Ball and he husband Louis Ball, who in the census described himself as an “artist, fancy tiles”. The Census of 1901 tells us that Clara was born in 1875 at Horham, Suffolk, and that Louis was born in 1874 at Croydon. There were five children: Beatrice (born in 1894, Shirley, Surrey), Charles (b.1895, Shirley), Jessie (b.1898, Thornton Heath), Laura (b.1899, Thornton Heath) and Arthur (5 months old, therefore born late in 1900, Shirley). Arthur William Ball was born 16 October, 1899, at Shirley, Surrey. In 1901, the family lived at 59, Zion Road, Croydon. By the time of the 1911 Census, Louis Ball had died, and Clara had become a grocer with her premises on the High Street in Bottesford. It is unclear why she made this move. The household consisted of Clara, Arthur (aged 11) and Harriet Taylor (63, a widowed relative of Clara who came from Saffron Walden, Essex). Clara stated that she was born in 1877 in the City of London, and that Arthur had been born in 1899 in Islington, London. Clearly, the information from the 1901 and 1911 Censuses are not consistent, and it is possible that they do not refer to the same people, though they are so similar that it would be a major coincidence if they are not the same. It may be that the information in one or other of the censuses were not entirely accurate information, perhaps deliberately so. Clara Ball is recorded as a grocer in Bottesford, in the Kelly’s Directories of Leicestershire of 1912 and 1916, but no longer by 1928. Also, she is not on the Bottesford Electoral Rolls between 1921 and 1925. 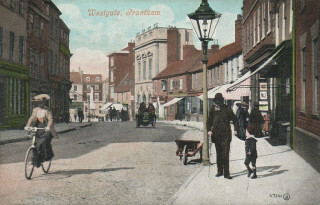 From the 3rd January, 1915 to the 10th April, 1917, Arthur was employed as a ‘chemist’s apprentice’ at the shop of B. Fillingham, 80, Westgate, Grantham, Lincolnshire. He joined the forces later in 1917, apparently under-age. His service records contain reference to him attending a chemistry course provided by the College of Preceptors during a two month spell while still in uniform, possibly during a spell of ill health or after he suffered an aeroplane crash. This may well have been preparation for a future career as a school teacher. The sparse service records from the National Archive that were located online record that Arthur William Ball’s service number was PI 18818. It is clear that he joined the RFC before 11th August 1917, not yet 18 years old, and that he was rapidly promoted to 2nd Lieutenant on probation and then posted to 103 Squadron. However, he was seriously injured in a plane crash on the 9th January, 1918, and was sent home to recover. He returned to flying duties later in 1918, and his promotion was confirmed on the 1st April. However, it seems that he never was able to attain the standard required as a solo pilot, possibly because of the effects of his injuries, and on the 6th November, 1918, was able to relinquish his commission. 8.17 Arthur Ball was assessed as being fit to be a pilot. In the Grantham Journal of the 12th January, 1918, the following report was printed: ‘We are glad to give a reassuring account of the condition of Lieutenant Arthur Ball who met with a flying accident at the beginning of the week. He sustained severe concussion and scalp wounds, but we understand he is going on well’. 4.6.18 Unfit HS 8 wks, fit LD Flying. To fly as passenger and dual till M.O. thinks he is fit for solo. 6.11.18 Relinquished commission on account of being physically unsuitable as P. or C.
His service was considered for the grant of War Medals, but it is not clear what medals he actually received. In 1929, a man called Arthur William Ball married Enid D. Crabbe at Farnham, Surrey, and a man of this name died in 1975, also in Surrey, aged 86. At present, it is not confirmed that this is the same Arthur William Ball.